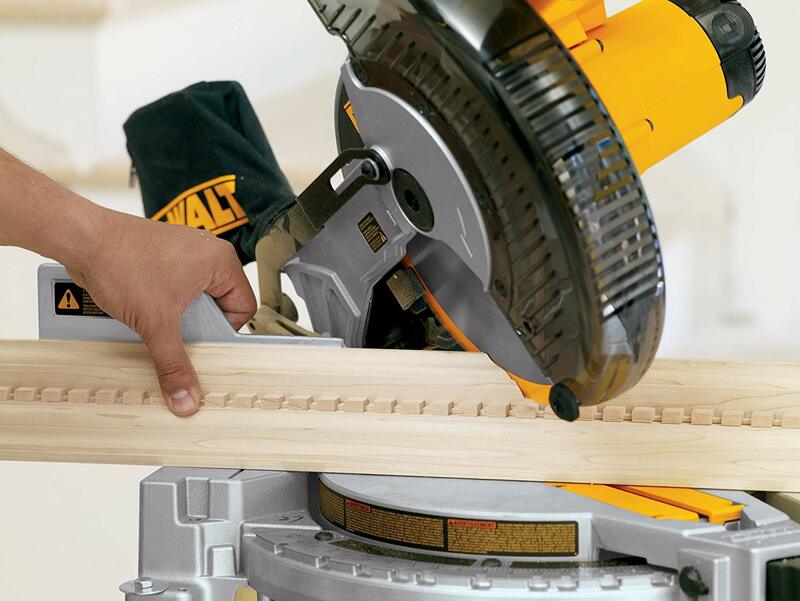 You are at:Home»Tool Talk»The Most Accurate Miter Saw For Trim & Moldings – And It’s Cheap! Sometimes, More Is Not Better, Especially When It Comes To Miter Saws! I’ve used almost every major brand and type of miter saw available over the last 38 years. Way back it was Delta and a few others, then came Makita (a favorite for many carpenters back then), and Dewalt. Others brands have joined the show, but you’ll find most Pro’s stick with Dewalt or Makita. Since Dewalt came into the picture, I would say both Makita and Dewalt have set the pace for innovative miter saw design and features.Today, both companies offer sliding, double compound miter saws with clamp systems, lasers, night lights, stand systems and more. Everything you could want in a miter saw. If you are into tools, you know how easy it is to get swayed into buying the latest and greatest miter saw with all the bells and whistles – and there doesn’t even have to be a salesman present. These new saws scream, “Take Me Home Now”. They have so many cool features it is hard to resist. Forget All The Fancy Features & Go Basic! 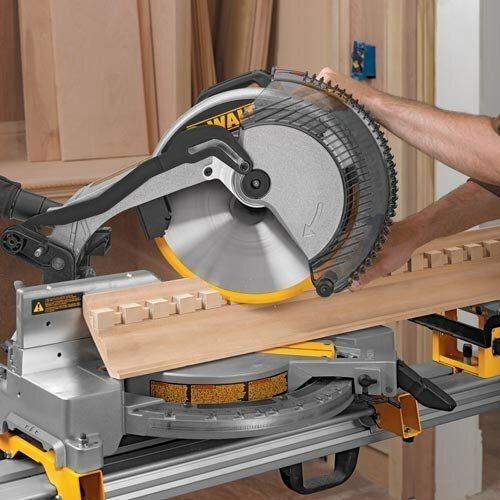 Now before I go any further, YES, I do own a Dewalt Sliding Compound Miter Saw with all those fancy features… Hey it does have it’s place especially for cutting wide boards and large moldings. However, beyond that, these fancy saw do not offer more accuracy – in fact, I have found the more basic the miter saw, the more accurate it is – especially Dewalt. Just keep in mind the cutting capacity limitations when considering this miter saw. I have included the DW713 specifications from Dewalt at the end of this article. Check it for any specs you wish to know. It has nothing fancy, no laser, no sliding capacity and the largest crosscut you can do is a 2 x 6 at 90 degrees – kind of sounds limited doesn’t it. But, that said, it is the simplicity of this saw that makes it very accurate and stay accurate after repeated use. Mine is very old and well used and still cuts amazing joints. I swapped out the Dewalt saw blade with a FS TOOL XL4000 Chip-free Trim Saw Blade. IMO, FS Tool saw blades are the best and they stay sharp for a very very long time! However, this saw blade is worth almost as much as the saw, but for the results I want, it was worth the expense ($166). A good alternative is the Freud 10″ x 80T Ultimate Cut-Off Blade which has a very similar tooth pattern and angle – but, I do suggest getting the FS TOOL saw blade, it will be a keeper and can be used on a table saw and other miter saws using a 10″ blade and 5/8″ arbor. IMPORTANT: When selecting a good saw blade for this saw, do not use thin kerf blades. I found thicker blades are less likely to get damaged cause blade wobble or vibration. Thicker blades will increase and maintain accuracy and quality of cut. By the way, don’t throw away the saw blade that comes with this miter saw, it is great for general carpentry like exterior trim, framing etc. 2) Fine Tune It Before You Use It – And Check It Periodically! This is so important! Most of us forget how far and under what conditions these tools are shipped. There are bound to be a few units that will have had some settings knocked out of square etc. This Video is For Setup of the Dewalt DW713 Miter Saw, Caleb Harris also includes sound tips for general setup that can be applied to many tools. This Is My Go To Saw For 60% of My Work!! As noted prior, I do own Sliding Compound Miter Saws, but 60% of the time I will use this saw (if I am cutting 2×4’s or 2×6’s I’ll swap out the blade). My sliding Miter Saws are used when I have lots of wide boards to cut. I have found the lack of parts, sliders and so on, keep this saw accurate and free of blade wobble and vibration (especially with the FS TOOL XL4000 Chip-free Trim Saw Blade). In the shop when I am cutting very fine parts for cabinets etc, the quality of cuts cannot be beat. And as an added bonus, it is lighter and smaller than sliding compound miter saws making it easier to haul on to job sites, or just moving it around the shop or house to do various projects. 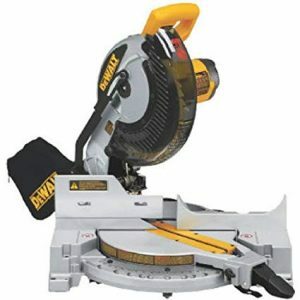 So, if you want an inexpensive miter saw that can tackle most cutting jobs, and do it with accuracy, don’t hesitate to check out the Dewalt DW713 Miter Saw – Currently listed on Amazon.com for about $220.00 (March 2019).